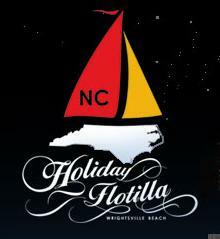 If you've missed out on the other 27 NC Holiday Flotillas, be sure to mark your calendars this year for the holiday event of the year! Not your ordinary Christmas parade, the 28th Annual NC Holiday Flotilla spans two days, hosting a variety of other events including the Launch Party at The Blockade Runner Resort we well as the Festival In The Park. The "Anchors Away" Launch Party will be held on Nov. 25, 2011 from 7-11 p.m. Tickets are $35 each and can be purchased online at www.ncholidayflotilla.org/Events/LaunchParty/tabid/84/Default.aspx. The Festival in the Park will take place the following day at Wrightsville Beach Park from 10 a.m. to 4 p.m. and is a family-friendly event. The trademark of the festival - the lighted boat parade - will begin Saturday, Nov. 26, 2011 at 6 p.m.
As a grand finale, a spectacular fireworks show will end the evening with a bang! The grand prize for 2011's lighted boat parade will be $5,000 cash, and more than $7,500 in cash prizes will also be awarded. For details on the parade and related events, visit the NC Holiday Flotilla website.